From French toast to peach pie, we've jazzed up the quintessential summertime dessert. Enjoy delicious and unique recipes for serving this sweet fruit during during peak peach season in July and August. Got company in town? Sweet peaches and heavy cream join forces to jazz up traditional French toast in this make-ahead breakfast casserole dish. This luscious dessert comes together easily and is the perfect ending to summer supper with friends. Use the softest and juiciest peaches you have, even slightly overripe fruit. For added peach oomph, chop some of the topping and stir it into the filling. This pie combines two of the South's favorite flavors: fresh peaches and fluffy, creamy divinity candy. 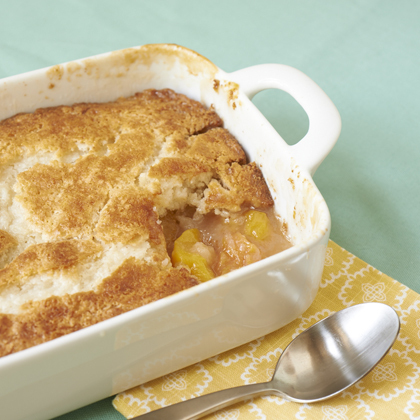 Here's a delicious ice-cream recipe that has all the flavors of traditional peach cobbler and doesn't require an ice-cream maker: Just stir the ingredients together, and freeze. Fold the whipped topping in with as few strokes as possible while making sure everything is well blended. Every cook needs a ta-da moment. Come to the table with this--crackly meringues layered with satiny homemade caramel and the season's best peaches--and you've got yours. You can make most of it one day ahead. Our version of the Creamsicle is silky, with distinct peachy flavor. It's a not-too-sweet pop that grown-ups will love but that's playful enough for all ages. The freezer aisle of your grocery store is stocked with a hearty selection of whole-grain toaster waffles that have less than 100 calories per serving. That's a low-calorie, grain-rich base for tasty combos that go way beyond butter and syrup--like this Peaches and Cream Waffle. We add softened ice cream, sliced peaches, cinnamon, pecans, and fresh mint leaves for a riff on the classic summertime treat. You'll be the new favorite house on the block when you serve Peaches & Cream Pie at your summer BBQ. We use a package of vanilla pudding mix and canned sliced peaches to save time in this cool and creamy dessert. Fire up the grill . . . for dessert? You bet! Super-moist lemon pound cake is grilled until crisp and toasty and topped with warm, tender grilled peaches and whipped cream for a sweet fruit dessert you won't be able to resist. Roasting fresh peaches brings out even more of the fruit’s natural sweetness and is an easy way to make a quick dessert. Hollowed out peaches filled with a creamy custard of sugar, egg yolks, and whipping cream makes for an easy after-dinner treat that's impressive enough to serve to guests. This tantalizingly-rich ice cream is outstanding, and we flipped for it in our test kitchen. Nothing captures the taste of summer better than Fresh Peach Ice Cream. Give it a try and then tell us we're wrong. Instead of broiling, sauté peaches on the stove in a mixture of melted butter and sugar. Serve with homemade whipped cream for a simple 5-ingredient dessert that you'll turn to again and again when the weather heats up. Store-bought piecrust saves time in this summertime-perfect peach tart. Bake until the cream is set, the almonds are golden, and the peaches are tender. The warm heat of ginger perfectly complements sweet peaches in this thick fruit sauce that's delicious on yogurt, ice cream or even a piece of toast. The succulent flavor of ripe peaches shines in this memorable breakfast recipe. This juicy crumble, based on one served by Outstanding in the Field, is packed with chunks of stone fruit cut into irregular pieces so that some pieces stay firm while others cook to a jammy consistency. It's all set off by a light oat-almond topping and whipped ricotta cream.